The “one another” instructions in the Bible are powerful. They often refer to our relational world of how we are to connect to each other. We know examples – love one another, pray for one another, encourage one another. Our passage today is a reminder of our need to be kind, compassionate and forgiving of one another. At first glance, when we read these instructions we may be quick to give ourselves a pass recalling all of the past ‘”nice” things we have done. On learning more about this scripture and what God desires of us, I realize I have more work to do. Being kind is more than a smiling face. It reflects a giving spirit and a desire to be useful and helpful to one another. Demonstrating loving-hearted compassion shows our genuine concern about each other situations. Forgiving one another freely and quickly for big and small things as our Heavenly Father does for us. 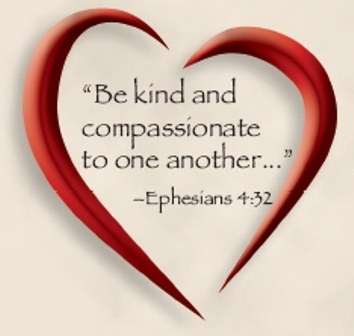 Kindness, compassion and forgiveness are outward expressions of who we are as God’s children. They reflect who He is and as His children we should carry His identity and His likeness in our care for one another. Carefully considering how we respond to one another and seeking to demonstrate His example puts our relationships on higher ground. More kindness, more compassion and more forgiveness in the world are reflections that will shine bright in a hurting world.